Most players feel that Madden is at its most exciting when they have the ball. Controlling the pace of the game and hurling touchdowns is extremely fun, but playing defense also presents unique and amazing moments. Is there anything quite as satisfying as picking off an opponent’s pass and running it back for a touchdown? We think not. While it may not be as glamorous as offense, they say “defense wins championships.” In Madden NFL 18, thanks to more realistic mechanics, playing defense has become more intuitive. If you’re struggling to pick plays, to defend the pass or the run, or just want to limit the damage on the scoreboard, our Madden NFL 18 defense guide will help you stop your opponent in their tracks. Just like on the offensive side of the ball, Madden’s defensive playbooks are ripped from their NFL counterparts. That means there are 32 different sets of plays for 32 different teams. Defensive playbooks can hold up to 500 plays in Madden, but unlike offense, the typical playbook doesn’t get close to that limit. Each team has between 275 to 300 plays on average. These plays are spread across different formations designed for different kinds of scenarios. Madden NFL 18 has 10 formations, but most teams only use between five and seven in their individual playbooks. You can check out the playbooks for all teams in Madden 18 (or create your own) by heading over to “customize” in the main menu. The question is: How do you decide which defensive plays to pick? In football, it’s the offense’s job to keep the defense guessing, and if you are playing a quality opponent, it can be quite difficult to guess your opponent’s next move. Luckily, there is a basic formula that many Madden players will use on offense, though, which will help you decide which plays to pick on defense. On first down, an offense is free to pass or run the ball. We’ve found success using a zone blitz play on first down protects against the run while putting pressure on the quarterback. If you stop the offense on first down, creating a second and long situation (5+ yards), we like to transition to pure zone coverage. While it’s possible some Madden players will run on second and long, in our experience, people usually can’t resist passing due to the threat of facing a third and long. Even if first down doesn’t go so well, and it’s second and short (less than 3 yards), we employ the same logic, as that’s a situation where the offense often takes a look downfield. On third and long, we like to either continue using pass-focused zone defense plays, or go for an all-out blitz. Putting a lot of defensive backs on the field to protect against the inevitable pass play is the safe play, but putting intense pressure on the QB in a tense situation like third and long is rarely a bad move. Some Madden players go for it frequently on fourth down. It can be hard to tell whether or not someone is going to take the risk based on the game alone. If it’s 4th and 2 or less, and your opponent is around the 50 yard line, there’s a chance they may choose to go for it. If you know the person you’re playing likes to take big risks, you can cover against this by picking a defensive package that crowds the line (more on that in the formations section). 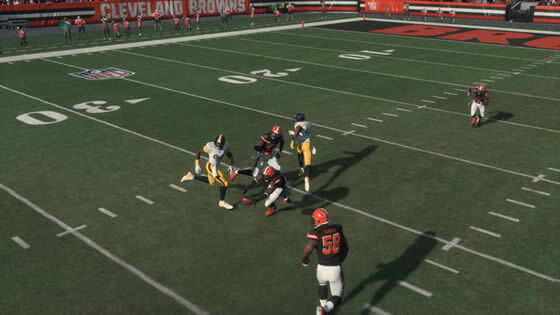 If your opponent is showing punt at the line, you can either just let the punt land without fielding it, or you can run back with your safety to field the punt before the snap. This will set you up to defend your opponent should they choose to go for it. The same goes for your opponent going for it instead of kicking a field goal, only this time, there’s no reason to run back a defender to field the play. Unlike when calling plays on offense, we think you should avoid changing your play calling up too much on defense. We rely almost solely on zone coverage, blitzing, and plays that combine the two. You will find man coverage plays in your playbook, but we’ve found zone coverage to be the more dominant approach.